Is It Possible to Buy a Home for 2.5x Your Salary in America’s Biggest Cities? How much home you can afford depends on your income. Many experts recommend that homebuyers should generally purchase homes worth 2.5 times their annual income. Yet, in many of the largest cities across the country the average homes have values which exceed seven times the average household’s income. Below we rank the largest cities according to how many years’ worth of median income is needed to buy the average home. Thinking about buying a home? Check out our mortgage calculator. We began this study by gathering data for the 100 largest cities in the country. Specifically, we looked at data on median household incomes and median home values. Check out our data and methodology below to see where we got our data and how we put it together. You can buy in the Midwest – Our data shows that if you want to be a homeowner, moving to the Midwest may be your best bet. In cities like Detroit, Michigan; Toledo, Ohio and Fort Wayne, Indiana, the average home is worth less than 2.5 years’ worth of the average household’s income. This would be considered affordable by many experts’ standards. Lots of saving required in California – While living in California can be nice, if you want to be a homeowner there, you should probably start saving right now. 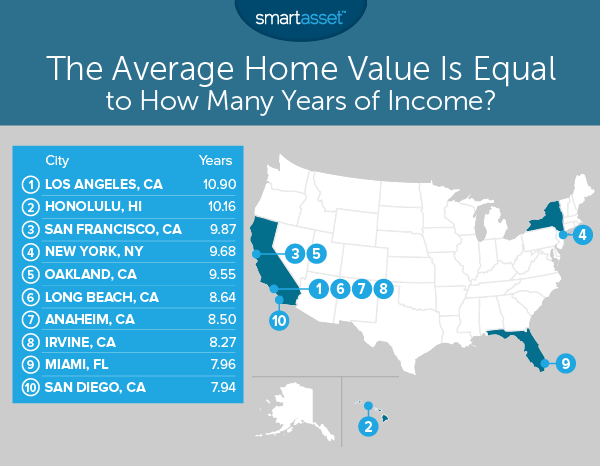 In cities like Los Angeles, San Francisco and Oakland, the average home is valued at more than nine years’ worth of income for the average household. Even the most affordable California city, Bakersfield, ranks 45th on our list. Los Angeles may be the most difficult big city for the average resident to buy a home in. The median home here is worth $593,500, while the average household earns $54,432 per year. That means it would take 10.9 times the median income to pay for the average home. Plus, Los Angeles has a high cost of living in general, so once you buy a home you may still be on a tight budget. If you’re thinking about moving to Honolulu, and want to buy a home, you may need to be patient. Data from the U.S. Census Bureau shows that the average home is worth around $661,700 and the average household earns $65,155 per year. In other words, the average home is equal to 10 years’ worth of the median household income. San Francisco is the poster child for exorbitant rent prices, so seeing it toward the top of this list isn’t too surprising. Despite the fact that residents here tend to do well (the average household earns over $103,000 per year), it’s still difficult for them to purchase a home that costs 2.5 times their annual salary. The median home in San Francisco is worth $1,024,000, that’s the highest home value in our top 10. The typical house here would be the equivalent of 9.8 years’ worth of the average income. According to Census Bureau data, the average New York home is worth $569,000, which is equal to 9.6 years of the average household’s income. One good thing for prospective New York homeowners is that mortgage rates in New York are actually below the national average. This means taking out a loan to buy your home in New York is cheaper than in other states. Another Bay Area city takes fifth. 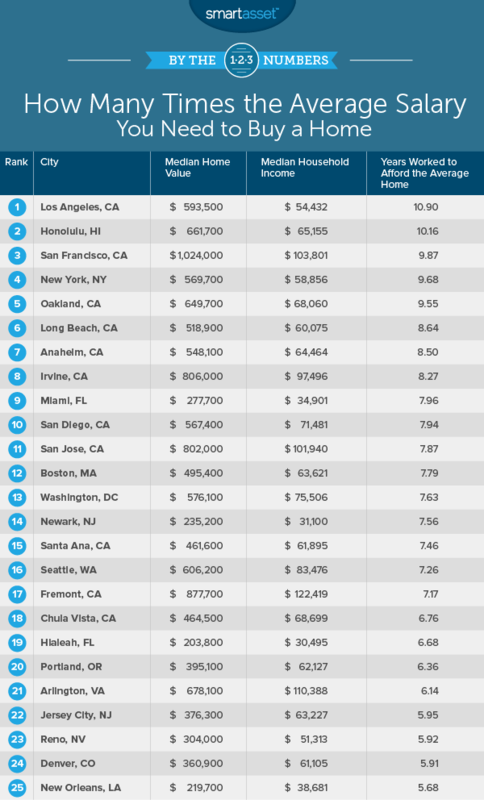 The average Oakland home costs just over 9.5 years’ worth of the average household income. On average, San Francisco households earns 52% more than Oakland households do. And homes in San Francisco are about 57% more expensive than homes in Oakland. This means when it comes to home affordability, Oakland residents are getting a slightly better deal than their neighbors across the bay. Long Beach is located just south of Los Angeles, the number one ranked city. Living in Long Beach is a slightly better deal when it comes to home affordability than L.A. The average house is valued at 8.6 years’ worth of the average income in Long Beach. Obviously, no one saves 100% of their income each year. Nor do most people buy homes in cash, but this shows the overall lack of home affordability of the area. If the average Long Beach resident wanted to save for a 20% down payment on the median home, it would take roughly 17 years of saving (assuming they were saving 10% of their income each year). Anaheim is also within the Los Angeles metro area. Like other cities in the area, home buying is a difficult prospect for most residents. The average resident here earns about $64,000 per year and the average home is worth $548,000. That means the average home is worth 8.5 times the median household income. Another California city, Irvine, takes eighth. The average household here makes a decent amount, over $97,000 per year. However the average Irvine home is expensive, worth $806,000. This means the average home is worth 8.2 times the average household’s income. This puts them way outside the recommended range for home buying. Buying the average home in Miami is largely out of reach for the average household. In Miami, the average household earns just under $35,000 per year while the average home is worth $277,700. In other words, it takes 7.9 years’ worth of income to buy the average home. However, if you can manage to buy some property in Florida is may be well worth it as the state has a below-average property tax rate. One more California city, San Diego, rounds out our top 10. The average home here is worth about 7.9 times more than the average household makes in a year. The average home in San Diego is valued at $567,400 and the median household income is $71,481. It is worth mentioning that property taxes in San Diego are below the national average. So once residents are able to purchase a home, they may get some respite on that front. Median home value. Data comes from the U.S. Census Bureau’s 2016 1-Year American Community Survey. Median household income. Data comes from the U.S. Census Bureau’s 2016 1-Year American Community Survey. To rank the cities, we took the median home value and divided it by the median household income. This number is equal to the number of years of income the median-valued home is worth. We ranked the cities from highest number of years to lowest. A home will likely be the single most expensive item you purchase in your life. So, it makes sense that it can be stressful, especially when it’s time to start planning. First of all, you will want to have an idea of how much you can afford to spend. This means knowing how much house you can afford. Your current income will give you a good idea of the minimum home you can afford. Many experts recommend a home that’s 2.5 times your annual household salary. But if you do not plan on buying for a number of years, it may make sense to plan based on future income. But remember it’s not just the mortgage you will have to pay, but also homeowners insurance, closing costs and taxes. To get the best mortgage rates, it is typically recommended that you have enough cash to put 20% of the home value as a down payment. Another plus of making a large down payment is that you will end up paying less in interest over the life of the mortgage. While saving up for your down payment, it may make sense to keep your funds somewhere secure but easily accessible, like a savings account. 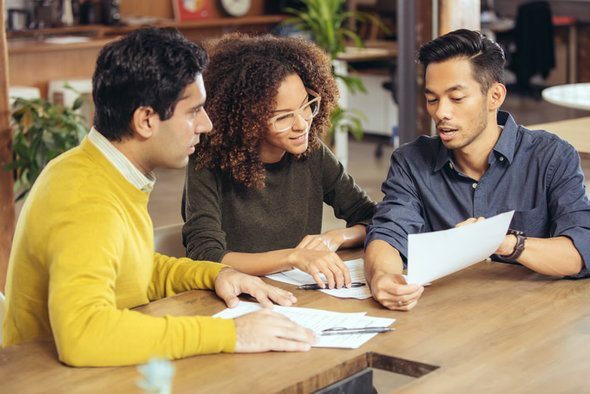 Finally, once you are ready to buy a home, you’ll want to make sure your credit report is in its best shape. This means disputing any errors you see on your credit report or paying off delinquent bills. Generally the better your credit score, the better your mortgage rate will be. Photo credit: ©iStock.com/Weekend Images Inc.